Double ka Meetha: Double ka meetha is a bread pudding dessert of fried bread slices soaked in hot milk with spices (saffron and cardamom). 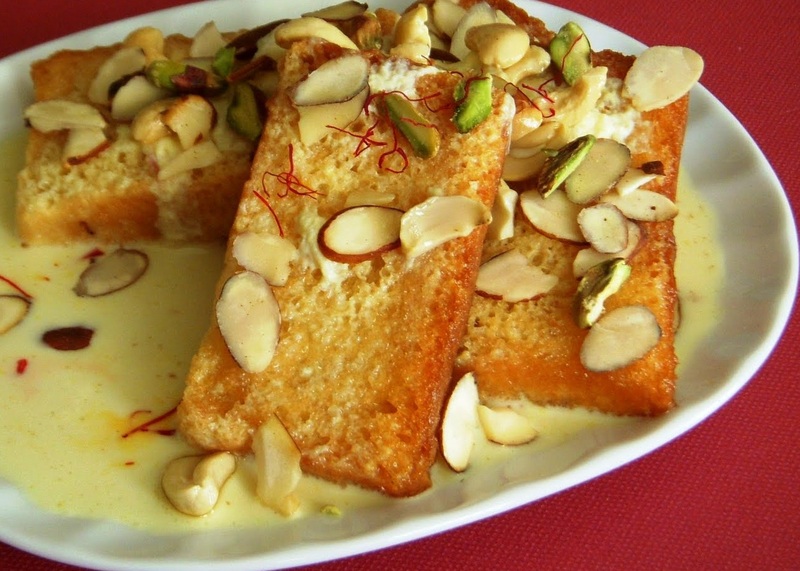 Double ka meetha is a dessert of Hyderabad. It is popular in Hyderabadi cuisine, served at weddings and parties. It is particularly prepared during the festive month of Ramadan and on Eid. Boil sugar with the water in a heavy bottomed pan, to make the sugar syrup. Stir continuously, till tiny little bubbles are seen on the surface of the liquid. This indicates that the syrup is ready. Keep the sugar syrup aside, to cool down. Boil milk with the condensed milk in a deep bottom pan on medium heat. Add in the saffron strands and green cardamom powder. Keep the thickened milk mixture aside. Take the bread slices and cut each slice diagonally into two. Heat the ghee/oil in a skillet. Shallow fry the bread slices, turning them occasionally until they turn golden brown on both sides. Allow the fried bread slices to cool. Take a rectangular baking tray and grease it evenly with ghee or oil. Arrange the bread slices in the baking tray in such a way, so that the entire tray is covered. Pour in the thickened milk mixture, rose water and sugar syrup over the bread slices evenly. Keep aside for about five minutes, so that the bread slices can soak in all the liquids. Sprinkle the mixed nuts and raisins on top of the bread. Seal the tray with aluminium foil. Bake in the preheated oven for about 25 – 30 minutes, or until the liquids are almost dried up. Rest the double ka meetha once done, without removing the aluminium foil. Double Ka Meetha is ready to be served.